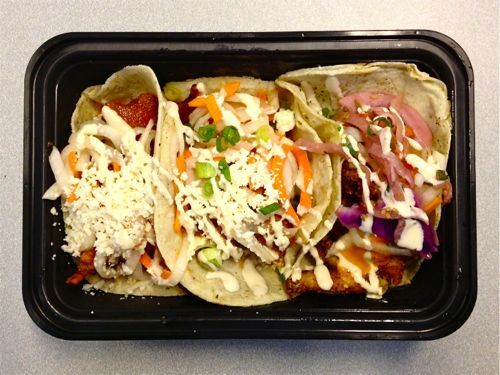 Korean tacos, once a novelty, are now available from a number of trucks that frequent Midtown. 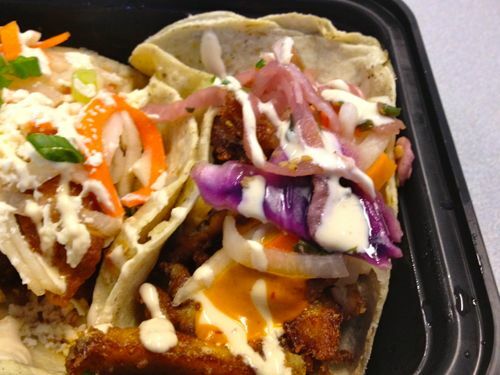 It can’t be easy for truck owners to differentiate themselves from the pack, but the Kimchi Taco Truck is doing just that by introducing some new menu items, including Korean fried chicken tacos. The updated menu includes burritos as well, but I went straight for the new tacos, ordering two Korean fried chicken tacos and one new fish taco. 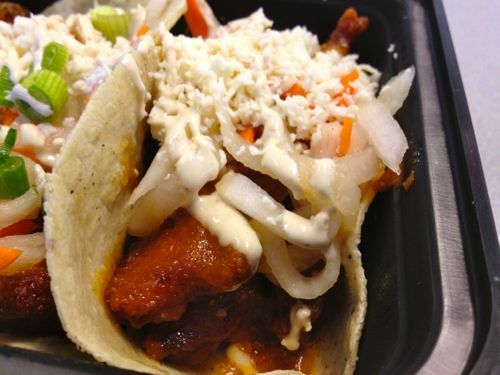 Usually the truck’s combination deal means three tacos cost $7 and four tacos are $9. However, if you want one of the new specialty tacos, which I obviously did, each taco will cost one dollar extra, which brought my combo to exactly $10. Pretty steep for a taco trio, but was it worth the price? First of all, the specialty tacos are in 6″ tortilla, as opposed to the 4″ tortillas the truck’s regular tacos use. Not only are these bigger than their regular options, but they’re also overflowing, as you can see in the photo. So, due to larger size and ample filling, I’m not going to complain about price. The Korean fried chicken was covered in a glaze made of agave, ginger, garlic, sesame seeds and Korean pepper and was topped with pickled daikon and queso blanco. There were several bite-sized pieces of chicken in each taco. Since Kimchi Taco Truck still does one-ply tortillas for each taco, this made for pretty messy eating, so just be sure you grab some extra napkins. At the time, I didn’t think my lunch was garlicky, but hours after the Korean fried chicken I could still taste it on my breath, even after crewing most of a pack of gum. The “krispy” fish taco was covered in a sweet rice flour and sweet potato starch batter, chipotle aioli and topped with mango salsa, kimchi slaw and pickled daikon. I don’t know that I tasted kimchi in my slaw or mango salsa, but still these were definitely the best fish tacos I’ve had in Midtown lately. Going into it, I was particularly excited for the Korean fried chicken taco, but actually the fish taco stole the show for me. There really is something to be said for a perfectly crispy (even after the walk back to the office), well-balanced fish taco. 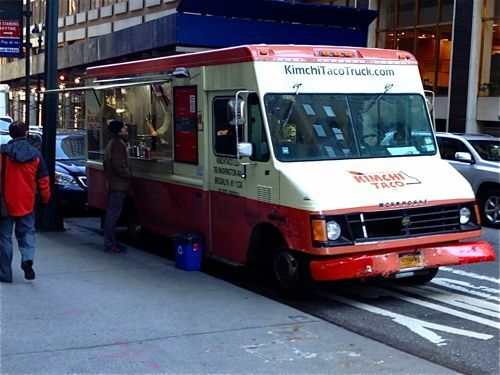 The Kimchi Taco Truck usually hits Midtown on Wednesdays and Fridays, but you’ll want to check their twitter or the ML Twitter Tracker before heading out. Posted by Rachel Goldner at 11:15 am, January 23rd, 2013 under Kimchi Taco Truck. Ah, I miss living in New York. There are no Korean taco trucks anywhere near me in Georgetown, DC! We have a grilled cheese food truck right outside of the campus and that’s about it.